The Web Spinner is a battery operated device that is used to quickly “wind” up spider webs essentially removing them without having to touch the web directly. 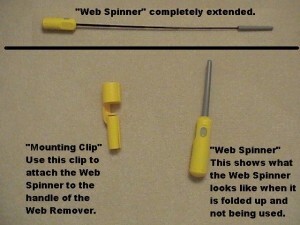 It uses two “AA” batteries to spin a cone shaped end which is placed directly onto any spider web you wish to remove. The cone is mounted on a telescoping extension that will reach a maximum length of 30 inches. 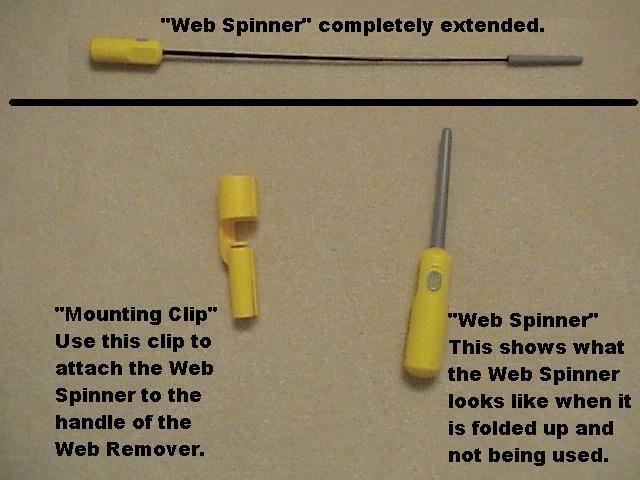 Simply extend the cone, turn on the switch and the Web Spinner does the rest. The cone features a special material which spider webs cling to and once it starts spinning, the cone will pull the unwanted web into a tight little ring ready for disposal. Most webs are removed in seconds and the Web Spinner can be used to remove several webs before it should be cleaned. Once webs are removed, just use a tissue or small napkin to wipe away the web ring which will form on the cone. There is no other maintenance or cleaning required.